Besides Tiger Muay Thai and MMA’s resident Brazilian Jiu Jitsu Black Belt Ray Elbe, the gym is currently hosting ADCC instructor and BTT Black Belt Roger Almeida. 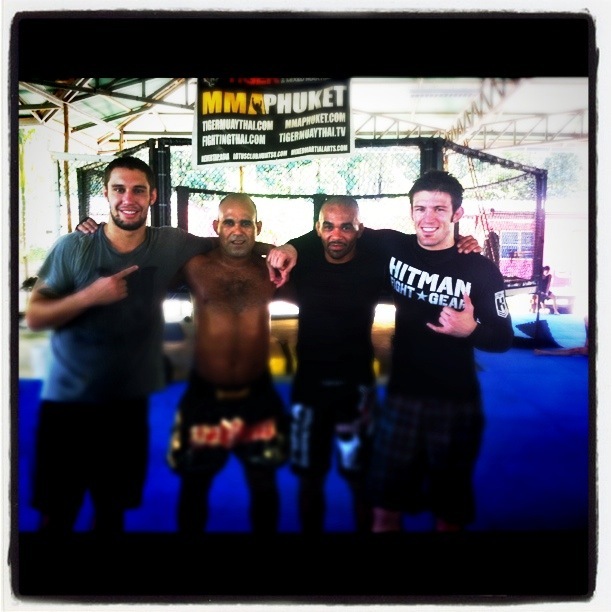 Passing through Phuket on his way to Australia–UK Black Belt and leading Sports Therapy coach Eamonn Madden made a visit to the training facility. Eamonn works with several of the top MMA fighters in the UK and has cornered fighters in the UFC-BAMMA-and Cage Rage promotions. A gifted grappler, he earned his black belt in Brazilian Jiu Jitsu under Leao Teixeira and specializes his instruction around technique and mental preparations. For TMT alumni in the UK check out his gym’s website.